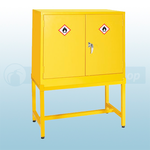 Available from the Fire Protection Shop are a range of Hazardous Substance Cabinet Stands that are ideal for raising metal storage cabinets off the floor for easier access. By using the COSHH stand it prevents users from having to stoop or bend to gain access to products on the lower shelves. The stand features adjustable feet to ensure the stand and cabinet remains level. The stand also facilitates floor cleaning.